Before my wife and I decided to become church planters of Coastal City Church, I was a camp director for 15 years. In that time, I was able to move away from doing any seasonal staff recruitment at job fairs. In fact, we did very little promotion of open positions to hire approximately 30 seasonal staff. 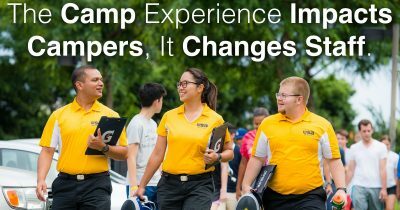 Our camp staff culture was based on the development of the individuals, and this was the key to our success in returning seasonal staff retention, recruitment, and ultimately growth in our summer camp attendance. As the seasonal staff became better at leading campers AND facilitating activities; our summer camp attendance increased. The better the experience for the campers, the more word of mouth advertising their guardians would do….without being asked to do it. I’m sorry, like it or not…your seasonal staff is the key to everything at camp. As goes the seasonal staff, so goes the camp. You have to get this right. You need to have a view of staff training that goes way beyond the tasks on the job descriptions. If you are accredited by the ACA, that’s great. But, at least when I was a standards instructor and visitor, there wasn’t a standard that led me to consider the impact my staff training would have on the camp 5, 10 or even 15 years into the future. The focus was on the immediate work that had to be done only. Also, many of our staff are working their very first job at camp. We have a responsibility to them and their future employers to set the staff up to succeed beyond camp. If you are in leadership at a camp, you must focus on leading the staff and let them focus on leading the campers. Now that I’m not leading at a camp, I have time during staff training seasons to be a guest facilitator or to provide coaching with you. Just shot me an email with your staff training or camp leadership question, it’s free and I’ll answer the best I can. It’s important to keep in mind that staff training begins during the interview and ends when the summer is over. One of our church operational core values is Principles Before Practice. We always want to know why another church or business does something before we copy it. Often, we can develop a better practice for our culture and community if we truly understand the principle behind the practice. Here are some camp staff training principles to understand before we get into the actual activities. Download four 5-minute activities to help staff think “like an owner“. Start training starts during recruitment. Carefully evaluate your job postings. Are you promoting for “Male Camp Counselors” or for “Guys Who Want To Do Work That Matters”. Hire your staff based on the one thing you can’t train them on, their character. You can train someone to take campers canoeing. But you can’t train them to not steal from the camp store. You can train them to lifeguard or facilitate a ropes course. But you can’t train them to make decisions based on a high ethical or moral code. If you are a Christian camp, hire based on spiritual gifts. Add a spiritual gift inventory to your application. Don’t promote the wrong people. Avoid promoting your best counselors to be supervisors. I often found that my best counselors were the best for a reason, and often made terrible supervisors. Part of this is also influenced by pay structure. I don’t believe a camp salary structure should be based on the job title. When I started at camp I inherited a system where supervisors were paid more than counselor and that created a culture where counselors felt like they had to “move up” after a year or two or not return. Counselors should be your cream of the crop, the best of the best…and you should pay them accordingly. Rule of 6. Develop an organizational structure of your staff so no person, including the camp director, has more than 6 direct reports. Lead out of relationships. Build time into each day of actual training for supervisors to meet with the team they lead. Set your supervisors up with healthy habits. Equip them to perform one-on-one evaluations with everyone on their team starting in week one of staff training. Don’t wait until the campers arrive. Utilize the Languages of Appreciation in the Workplace. (I lead a workshop called, The Love Languages Go To Camp if you’d be interested in that) Based on Manage By Appreciation program. Create safe spaces. Assign sleeping accommodations to resident staff so supervisors and the staff they support don’t sleep in the same space. It’s harder to coach someone when you share a bunk bed. Model well. Check out this post: More is caught than is taught. Train both ends of leadership. The leading and the following. Remember, most of your staff have never had a supervisor. Train them how to respond to leadership by equipping them with clarification questions to ask, what to do if they think something is unfair, etc. The intention here is to kill gossip. Equip the team with understanding. Use the DISC profile assessment to help your leaders and staff relate better to one another. Bring in returning staff 24 hours before new staff. Bring them up to speed on changes. Get all of the “but we’ve always done it that way” out of their systems. I also gave out assignments of who would be leading what during training. I require all supervisors to lead one thing during training and encourage all other returning staff to do the same. On the first night of all staff training, cook together. We use a menu with lots of different items that need to be prepared. Individual Pizzas with all kinds of toppings, taco bar, pasta bar, fondue etc. While everyone is cutting veggies, rolling dough, making sauce etc…they are free to talk. Check out my post on Distracted Listening to see why this is effective. In the past, we have also created scavenger hunts and hid the ingredients all over camp. This accomplished a camp tour for new staff at the same time. You can do this with a large staff. We’ve done this type of activity with up to 50 people. Play lots of games in the first 24 hours. This both teaches games to lead with campers, and it develops the staff as a group. Kill last summer. Ask your returning staff not to tell stories of “last summer” until day 3 of training. You don’t want to create false expectations for the new staff based on stories they hear without context. Also, new staff can feel overwhelmed with the idea that they are never going to be part of “this place”. Begin with the end in mind. Have each supervisor write a letter to each staff member they support. The letter is to be given to the staff member at the end of summer. It should include promises and goals about the kind of leader the supervisor wants to be. Avoid camp cliche training. I avoid the low ropes course during training, my supervisors. Most likely,they’ve all been through it. And, most of them are trained facilitators by this point. Besides, they aren’t a separate team. You don’t want an “us” vs “them” mentality. Telling isn’t training. Make training hands on and active as much as possible. Read my comment about the popcorn kernel experiment I gave in reply to a question on a previous post. I’ve avoided putting actual activities here as much as possible. Why? Principles before Practices. However, I do have four 5-minute activities available here that you can use during seasonal staff training or in-service meetings throughout the season.